The brake pad facility was housed in a factory setting where several other products were being manufactured during the time of the floor’s installation. The designated square footage needed to meet the brake pad distributors and industry’s strict regulation requirements..
Cornerstone™ works with several multi-national companies, but it can be difficult to maintain consistent workflow and communication with a company’s headquarters when it is thousands of miles from a job site. Our single source system affords these companies the opportunity to receive the same quality of floors in Mexico or Canada as they would in the U.S. It is also imperative in a setting such as this brake pad manufacturer where surrounding production is simultaneously taking place to keep your work space clean and safe while not disturbing the surrounding manufacturing. The Cornerstone™ installation team first prepped the substrate of the 140,000 sq. ft. manufacturing facility with mechanical preparation utilizing HEPA filtration until a proper surface was created to level the floor with primer. After the primer set, the Cornerstone installers proceeded to mix and spread the heavy duty epoxy mortar matrix before adding a layer of grout and a urethane top coat used to improve the flooring system’s friction coefficient. 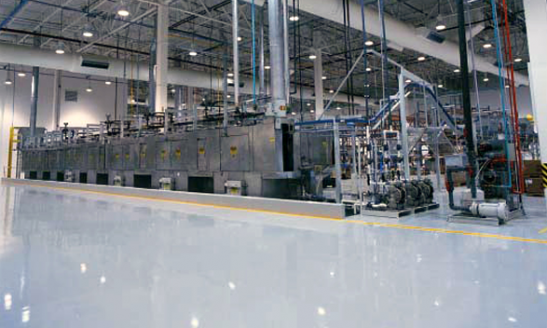 The resulting flooring system is twice as strong as normal concrete and does not produce dust that can damage both the products and machinery used in the manufacturing process.The opportunity for miscommunication and improper installation is great when dealing with products needing to meet strict regulation requirements from countries all over the world. With one team in place from concept to completion Cornerstone was able to install the new flooring system on time and with no loss of production for the rest of the facility. The finished Cornerstone FactoryFloor® was installed efficiently and on time due to Cornerstone’s guarantee to never use outside contractors.The finished flooring system not only remedied the clients need for quick and clean installation that will meet all their industry regulations, but provided a finished product that guards against deterioration from heavy traffic and use.The flooring system is easy to clean and maintain and included UV stability and light reflection to save energy and maintenance expenses. This resinous flooring system is over 10 years old and has had no service issues.